Crossing from NE corner of Hollywood & Highland to SW corner. Before 18 August 2017, I’d never shot more than the occasional Street Photo. For 2 years prior to that day, I’d hosted international students & travelers at Runaway University, and every time they’d head off to the Hollywood Walk of Fame I’d just roll my eyes. On that day Kamal (Nepal) & Arimo (Finland) convinced me to go with them. Yes, it was a lot of pop banality, but the travelers drawn to that place were also more beautiful than I expected. Like salmon swimming upstream (in a good way) I saw people who might not entirely know why they were there, but who had spent their lives consuming culture often created in Los Angeles. They might not know exactly what they expected from this place, but they felt a powerful calling to this cultural ground zero. Then Arimo used the Walk of Fame App he’d downloaded to find Donald Trump’s Star. That day Trump’s name was crossed out by 3 chalk lines. It was simple and elegant, but also a bold statement. I took a picture of the star and vowed to come back once a week for the next 52 weeks to photograph whatever was happening at the star. After a few weeks, I realized that just showing up, photographing the star, and heading out, wasn’t very interesting. I had to hang out at the star. If I did, I’d eventually see amazing things. Like the day witches from the Los Angeles Tarot Society came and performed an elaborate Babalon Invocation at the star. 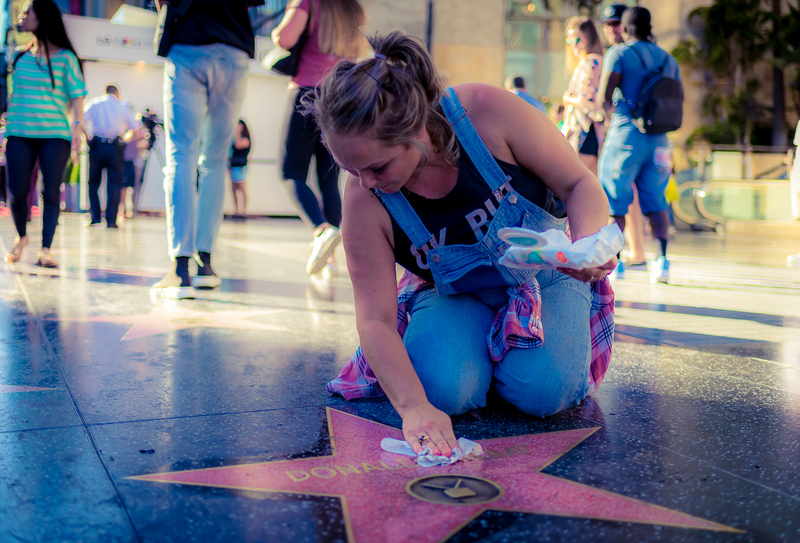 Or the day a woman in denim overalls came to take a Thumbs Up Selfie with the star, and finding the star dirty, got on her hands and knees to clean it. That was an unexpectedly sublime moment. That woman did not change my feelings about Donald Trump, but she did change my feelings about Trump Voters. So hanging out at the Trump Star was good. But I can only stand there for so long. After half hour or so I find myself wandering down Hollywood Blvd to see what’s going on at LACE (Los Angeles Contemporary Exhibitions). Then I’ll come back for another half hour at the star. Then I’ll go down to the Veggie Grill on Sunset and eat something. And so on. 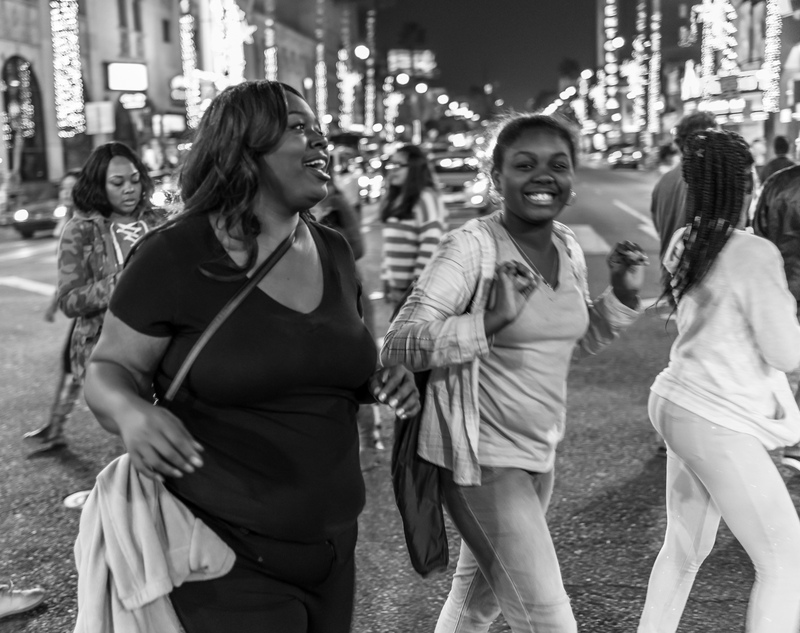 With camera in hand, and Hollywood being a colorful area, I started to take more pictures. After a few more weeks, I realized it was a thing. And Metro was born. I have been planning to start a website called Sand and Stars LA which was to be about alternative places for travelers to visit. 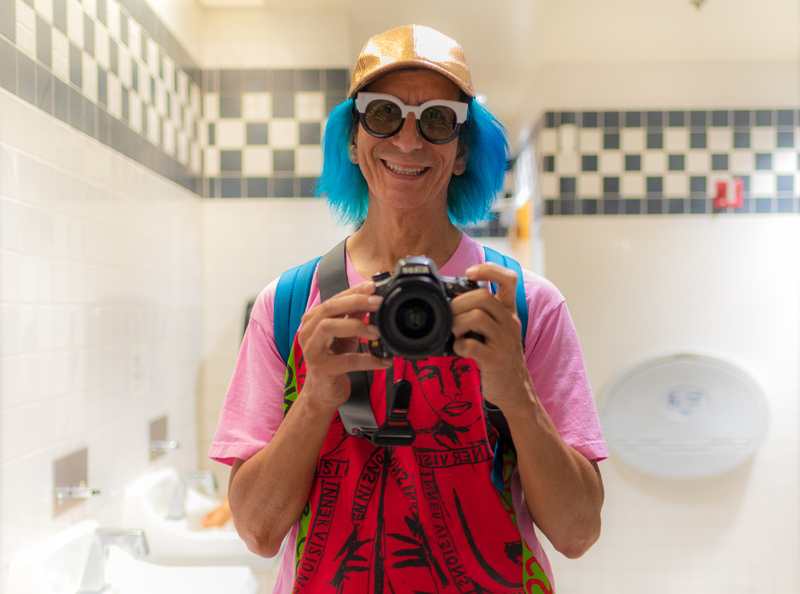 But now, I’ve decided not to make that list of dear traveler, you should go see this, locations, and to instead let Metro be my small offering of what goes on in Los Angeles. A tiny piece of a big city. A few moments in the city of my birth. Metro by Glenn Zucman is licensed under a Creative Commons Attribution 4.0 International License. Permissions beyond the scope of this license may be available at glenn.zucman.com. The circumstances of how each of the images on this website came to be vary greatly. Still, one overarching truth is that whatever I have managed to depict here, it is the product of an enormous number of souls living in this world and trying to make the best of it. To all the mostly anonymous faces on these pages: thank you! This website is built with WordPress. I can’t thank enough all the talented & generous people who’ve created this free & open platform that empower authors and respects freedom. The theme is Azalea by Just Good Themes. The WP Plugins I use include: Admin Toolbar Menus by Ben Bodhi, Google Analytics Dashboard for WP by Alin Marcu, W2O Football Fans Admin Color Schemes by Shishir Raj Adhikari & Jetpack by Automattic, featuring Markdown by John Gruber, Aaron Swartz, et al. The site is running the current version of WP, with PHP 7.1.12 & MySQL 5.5.58.